Hyderabad: India's 1st features EZTax.in, a fast-growing Online Tax Compliance Portal covering Direct (Income Tax), and In-direct (GST) Taxes through both Software, and Expert Services has announced on Tuesday that they have released enhancements to its unique India's 1st features. Suneel Dasari, Founder and CEO @ EZTax.in said on Tuesday, "The updates to the unique features are aimed to increase the confidence among self-service, or do-it-yourself tax payers, a segment that is going go grow through tax education, and financial literacy in India." He said, "The level of innovation imbedded in EZTax.in, was not seen in the Indian Tax industry so far, is a testimonial for its technology leadership in building highly automated, easiest tax filing solutions for greater good." The new enhanced features rolled out with EZTax.in include: Snap your Form16 - a feature to read Form 16 data through advanced OCR capabilities, and to fill the IT questionnaire. 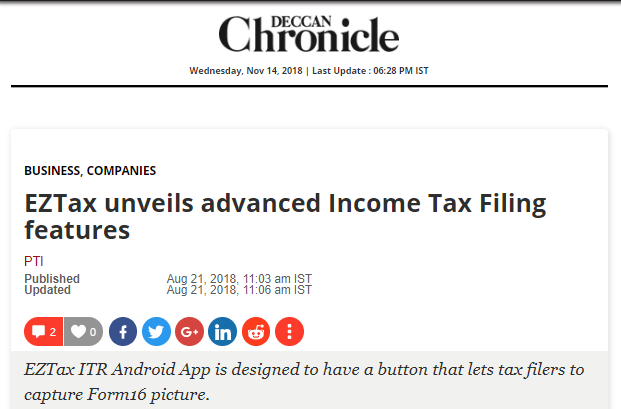 EZTax ITR Android App is designed to have a button that lets tax filers to capture Form16 picture. With its heuristic algorithm, the app let the user know the quality of reading. Tax Optimizer - provides recommendations to plan the income towards tax saving investments to increase refund for the next year. Also provides a comparison between current year and next year tax calculations. Creative Audit - in our survey, 60 per cent of the Online tax filers are concerned about IT Notices due lack of knowledge on how to file their taxes correctly. This feature helps tax filer know upfront about the potential possibility of getting an IT notice through it's rule base. Tax Filer has an opportunity to correct or continue with the data. Express Filing - helps the tax filer to select a pre-defined tax profile such as "Employee", "Business", "Trader" etc. to compose a set of questionnaires to reduce uncertainty while entering the data. "While we have limited number of days to eFile the returns this season, 40 per cent of the tax filings are expected to be e-filed in next 10 days, coupled with the late penalty introduced through Section 234F will certainly increase the number of tax filers substantially when compared with last year. The enhanced features rolled out now @eztax.in should make it even easier to e-File without a tax consultant's help." Future Growth In addition to our capabilities, solutions in Domestic Taxes, we are planning to launch solutions that will help Non-Resident Population, along with Tax Savings, PMS products using Artificial Intelligence (AI).